I have shown two methods to upload files in android. In today’s tutorial I will show another simple method to upload files. With this method you can upload multiple files in one request + you can send your own string parameters with them. Here is another method on working with uploading of images. These are the things to do after creating the project. 1. You have to include two libraries in the your project build path(Download these libraries from here apache-mime4j-0.6.jar and httpmime-4.0.1.jar). 2. Add these libraries to the project build path. 3. Here you can see the the other things you need to remember while connecting to a server. Note : I am working here on the local system as server. So I have used the server domain name as 10.0.2.2. Please change this according to your need. OK Now open your main java file and copy this code into it. android:text="Multiple File Upload from CoderzHeaven"
android:text="Selected File path : "
echo "The first file ". basename( $_FILES['uploadedfile1']['name']). echo "n The second file ". basename( $_FILES['uploadedfile2']['name']). Please leave your comments. If you like this post, please hit a “+1” for this post and share it across your networks. Hae, Thanx a lot for the wonderful work, it helped me a lot in my work when it was most required. i got an error Multipart entity doesnot Implement #get Content why??? You didn’t include the jars in the build path as suggested. Hi, do I have to change anything in the php code..? Hey LamprosGk check whether the changes you made might be affecting the code. This is a perfectly working code. How u fixed your problem (Files not geting uploded in server,Even if t entire code goes fine)?? Did u made ne changes or how it got uploaded for u? Hi, I have a same problem get “upload complete..” toast on the screen but do not see my files on a server. How can I solve this? PLease check whether the selected file path and the variable names are corect. because if there is no problems such as crashing or somthing then these may be the errors. Check the permissions on your web server. The upload directory should be writable by PHP. By the way what about the BASE64.java(n Uploading Image porj),,Those thing ned not 2 b used here? Base64.java is not needed here, instead of that we use two jars. 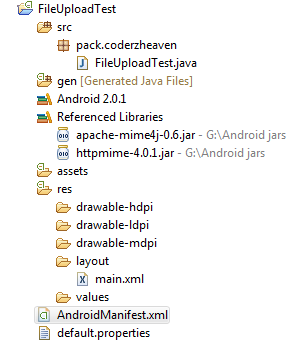 (InSide my Project)->Android2.1->Build Path->Configure Build Path->Add External JARS–>httpmime-4.0.1…. Don’t point to a folder, point to the jar file. First copy the two jars to a folder outside your project (eg:D:) then point to those jars. This should work because this is how we add jars to our project. Iam getting errors on tis line..
have jst copy pasted ur code,,checked the ID’s in XML which matchs wid the code,,bt stil geting the error?? Please check the quotes(“), this may be causing the problem. Delete this quote and type this quote again. This happens when you copy something from a webpage. But t file s note getting Uploaded,,Wot maid b the problem? Did you tried uploading a smaller file to the server. Check whether your directory exists or not. yes i already have directory..but response from server like this.. I think ‘/’ is the problem. Use some File upload software like “FileZilla” to upload the files to server. James a upload the folder on server but image is not able to upload. But this code is working correctly in xampp server. I am upload the php on my server but they always run the else part of php and show error. Did you check the parameter name “uploadedfile1” is same in android and php side. I am getting very strange error: Dalvikvm exception instantiating org.apache.http.entity.mime.content.FileBody. It can not find FileBody.class. I ve been trying to find any solution on the web, but no results so far. If somebody know how to sort it out, any help much appricieted. That is exacly what i am getting. Did you add the jar to the referenced libraries in the buildpath. I think you didn’t do it, that is why the system can’t find the class. I wonder what you think about it James. Your tuts are awesome and I would appriciate help form you. Hello slawomir :- Those links are good. Now what is that you want from me? Are you getting any errors following my post. Please explain. way of overcoming that problem is the way to go. Sorry I added wrong second link last time. Every lib is added still cant find FileBody Class. I have no idea what is worng. Dennis wrote that problem started with using sdk17??? Sorted works like a dream. Check out the link again. hi…i using your example ..it help me alot, however i get some problem when i need check image type in php…can you help me? Can you send me the error? be created in the server. Got this error when i tried to upload it. im getting the below error.. y is it?? Add the jars as instructed in the post. Also check the ‘Order and Export” tab in the project properties. i hav checked order and export.. my jar files are in tat. http://www.coderzheaven.com/2012/04/26/upload-image-android-device-server-method-4/ THIS LINK IS PERFECTLY WORKING FOR ME…. y im getting those error, i hav added jar files.. when i hit start upload button it shows force close..
thanku so much… this worked fine for me!!!!!!!!!! i have solotion for this. dont store blob in mysql but store the path of the file in database.. and call it. This is an example of how to store an image in SQL Database. Also if you store the path and later when the file gets deleted, then what will you do? use delete query to delete in database the row of the file and use unlink(“$file”); to delete files in folder. I want to do on asp.net server side. Can you help me? Please check the upload directory coded in the php file. Make sure you have the write permission in the server to upload image. how can i post image + string to server with your code? This example actually demonstrates this. hi i already finish code it to eclipse but my problem is when I’m able to click the the upload button, it doesnt continue to upload.. why its that happen? can’t say much with this information, but make sure that you add the internet permission in the AndroidManifest file. I can only select one image, not two. When i click button2 and select second image first image selectedpath1 goes to null and selectedpath2 is showing correct path to the second image. My targeted API is 16. Looks like it happens when you have 3 different gallery apps to select the image. I unable to upload the image using above code, its not working for me, i am getting message that image uploaded successfully but when i checked to the server there is no any entry. Check the server folder permission and your upload URL. am geting error on following line..
can u please help me to upload pdf and doc file from sdcard and from drive. please check in the Logcat the reason for error and paste it in the comment, then only we can fix it. Make sure you have INTERNET permission in the manifest. intent.setType(“file/*”); and I am getting NullPointerException in getPath(). A very helpful tutorial, in my case I want to upload files a automatically to the server, after they are been captured. I should check if wifi is on, before sending them. So if wifi is on I send. How would I send them automatically to sever? Please help, M a newbie to android. I was using on-click button it was working fine, now I have to send them to server automatically. what if file size is more than 2 mb , 5mb . I am not able to send to send big file size in 3g network. You can try this post for uploading big files from Android. can we upload multiple videos to server by this code..
I’m not getting any path. If i give path manually its closing the app before going into doFileUpload method. Please help me. Any answers should be appreciated. You mean you are not getting the selected file path from the gallery?. Try using any File Explorer and get the path and hardcode the path to test. Also make sure that you have necessary permissions.